The modern women's suffrage movement had its beginnings in the 1840s but gained most of its traction around the late 1800s and early 1900s. The Nineteenth Amendment guaranteeing women the right to vote was established on August 20, 1920. 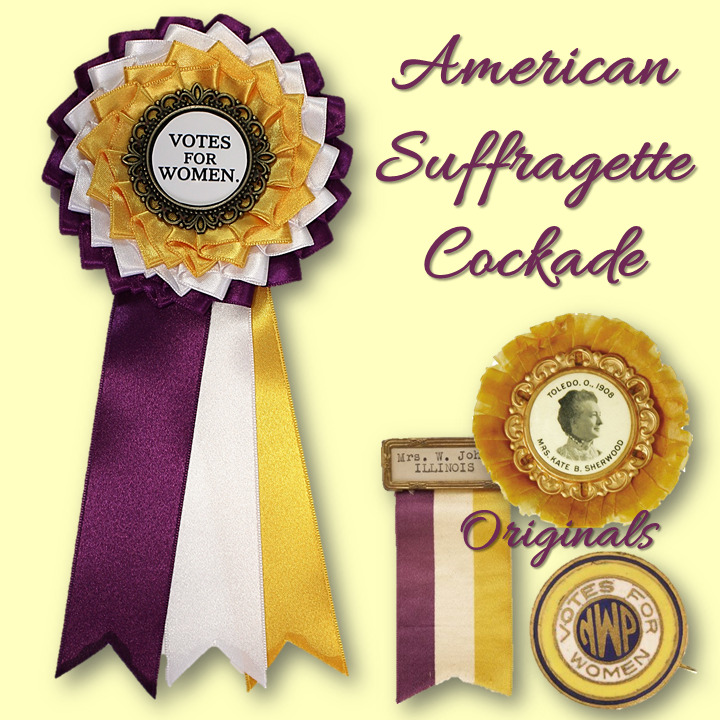 Ladies and gentlemen who campaigned for women's suffrage often wore colorful badges to support the cause. Yellow, white and purple was a favorite American color scheme. Approximately 3" across rosette. Streamers are approximately 3.5" long. Silver-plated pin back is 1" wide. Tri-Color Scheme in Suffrage Parade. CHICAGO. June 7. - Yellow, purple and gold was the predominating color scheme in today's suffrage parade here. Most of the 40,000 women paraders wore coats and skirts of white serge and white canvas shoes. A tri-colored cockade of gold, white and purple adorned a white silk taffeta-covered straw hat. Bunting flags with the tri-color were also carried by the paraders.